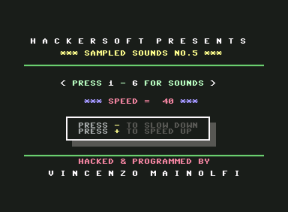 Right from the start Hackersoft had a fascination for digitized music and speech on the Commodore 64. This evolved into producing actual demos that included all types of digi music, sounds and speech all from a simple BASIC program listing. 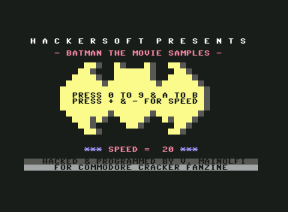 Armed with this listing and a Datel Action Replay cartirdge, Hackersoft was on a mission to hack as many Commodore 64 digitized offerings available. ASSISTED BY: The exact source for these sampled sounds is unknown. PRODUCTION NOTES: This program is made up of only 53 lines of BASIC code. It utilised the infamous listing to playback the digitized sounds. PRODUCTION NOTES: Another sound sample that I hacked and added my own BASIC controller that allows you to change the speed of the sample. ASSISTED BY: Rob Hubbard who originally produced the sounds samples for Firebird's 'I-Ball'. PRODUCTION NOTES: This program is made up of only 27 lines of BASIC code. 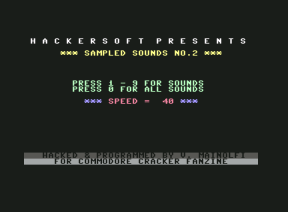 It was one of the first sampled sounds productions from Hackersoft, which utilised the infamous listing to playback the digitized sounds. 'I-Ball 2 samples' was also produced but has since been lost. PRODUCTION NOTES: This program is a VERY simple BASIC controller. 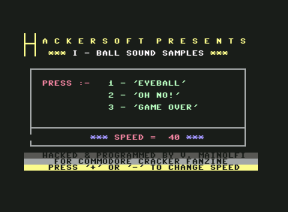 The sounds were ripped by loading in the game; resetting the Commodore 64 using an Action Replay cartridge; typing in the special BASIC code that plays back the sound, and then saving it all as a .PRG with an Action Replay cartridge. PRODUCTION NOTES: Similar to the previous Sampled Sounds demo, this version now has a speed controller to slowdown and speedup the sounds. Obviously, when using CCS64 emulator, you will need to use the minus key to speed up and the plus key to slow down (don't ask me!). It isn't exactly known where the Sounds Samples demos 1,3 and 4 are hiding. If anyone owns a copy, please get in touch. ASSISTED BY: New Generation software who produced the samples speech. PRODUCTION NOTES: The sampled speech within this demo was ripped from Jonah Barrington's Squash, which was a game produced by New Generation Software. They were ripped by loading in the game; resetting the Commodore 64 using an Action Replay cartridge; typing in the special BASIC code that plays back the sound, and then saving it all as a .PRG with an Action Replay cartridge.